Blizzard joined the G. I. Joe team before its closure by the government. His experience as an Arctic Instructor made him the man to train under. To survive his kind of warfare, you not only have to worry about the enemy, but the unforgiving cold weather. Blizzard is as tough as the combat conditions. His methods may seem rough, but the troops either qualify, or face the consequences. His claim to fame was after he led an experimental program that lasted an entire winter. It was the worst place he could find, and he loved every minute of it. He spends more time hanging out with the wildlife, as if he likes the company of polar bears rather than humans. Some might say his personality is a lot nastier. When the G. I. Joe program re-organized, Blizzard formed the Arctic Unit, and hand picked the soldiers he thought deserved to work alongside him. You have to give him respect, and plenty of room for his ego. We are all just happy he is on our side. From General Hawk's Files: "I compare Blizzard to a polar bear with an attitude problem. He's got the experience, and performs well under the arctic conditions. He doesn't work well with others, but his saving grace is his service record. Give him a mission with extreme circumstances, and he will pull through-no questions asked. We needed somebody tough enough to handle the Arctic Unit, guess who was number one on the list. I may get complaints from his teammates, but they respect him and that's what counts." Iceberg grew up in hot weather, and he hated it. As soon as he was old enough to enlist, he signed up for duty in Alaska. The cold is his element-he's not happy until the mercury drops well below zero. Iceberg possesses both the knowledge and ability to endure freezing temperatures. This is not to say he's impervious to lethal effects of hypothermia, rather a passion for the survival within the element. Give him an M-16 rifle and an icicle and you'll have an igloo full of COBRA prisoners within the hour. He respects the cold, and uses it to his advantage. When the G. I. Joe program re-organized, Iceberg returned as a member of the Arctic Unit. He's an instructor that loves his job. He's always cool-in more ways than one. From General Hawk's Files: "If I have a mission that requires cold weather involvement, odds are Iceberg will volunteer for it. This guy loves the cold, and everything about it. His knowledge and survival skills give him the advantage. He's more happy to climb a mountain, build his own igloo, and fish for his dinner. It's like summer camp in the winter for him. He knows what it takes, and always gets results." 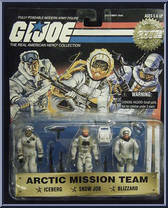 Snow Job was the first arctic soldier to join the G. I. Joe Team. His talents were needed when the battle against COBRA took to the cold climate and snow covered mountains. He doesn't particularly enjoy the cold, but thrives on what he can do in it. He's an expert marksman, qualified on all NATO long range rifles and laser targeting systems. Snow Job was a major contender for the Olympic Biathlon before his enlistment. He can still ski down steep mountains and pick off a target 1,000 yards away, making it back to base before the end of a poker game. His reputation precedes him, not only as a skilled target shooter, but as a major con artist. Snow Job's scams are legendary within the barracks, and no one will dare take a bet from him. His teammates steer clear of him around pay day. When the G. I. Joe program re-organized, Snow Job returned as a member of the Arctic unit. He won more card games than anyone cares to remember, and he never misses a shot. You can bet on him to be the winner. From General Hawk's Files: "He is a highly qualified individual. A definite choice pick for the team. His talents with a rifle are as legendary as are his all night card games. Snow Job is one of the arctic experts that really doesn't like the cold. Very strange, since he performs best in that environment. If we miss him, we figure he is in one of two places-out target shooting, or out spending the pay he won off the last poker game he played. Trust him on the battlefield, but never take him up on any sure bets . . . "
Contribute pictures, update details or suggest corrections for Arctic Mission Team. Write a review about Arctic Mission Team.